When the Allies stormed Berlin in 1945, Adolf Eichmann, the operational manager of the Final Solution, shed his SS uniform and vanished. Bringing him to justice would require a harrowing fifteen-year chase stretching from war-ravaged Europe to the shores of Argentina. 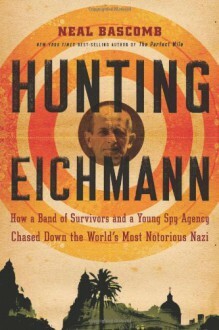 Hunting Eichmann follows the Nazi as he escapes two American POW camps, hides out in the mountains, slips out of Europe on the ratlines, and builds an anonymous life in Buenos Aires.Meanwhile, concentration camp survivor Simon Wiesenthal’s persistent search for the monster gradually evolves into an international manhunt that involves the Mossad, whose operatives have their own scores to settle. Presented in a pulse-pounding, hour-by-hour account, the capture of Eichmann and efforts by Israeli agents to smuggle him out of Argentina to stand trial bring the narrative to a stunning conclusion. Based on groundbreaking new information and interviews, recently declassified documents, and meticulous research, Hunting Eichmann is an authoritative, finely nuanced history that offers the intrigue of a detective story and the thrill of great spy fiction.